Whether you’re shooting still photos or video, using a tripod can improve your results quite a bit. But if you’re carrying a bulky tripod around with you all day it can sap your energy and slow you down. Plus, traveling with heavy tripods can be a real drag. We’ve scoped out the best lightweight tripods and done a run-down for you. Our categories, below, are light tripods for still photography and lightweight camera tripods for video. The Sony VCT-R100 is a lightweight camera tripod for still photographers with relatively light cameras. If you’re looking to travel light and still take stable photos, this might be the model for you. This lightweight three stage tripod comes in black and has a pan/tilt handle built in. Note that this model does not have a quick release plate to easily remove and remount your camera to the tripod (you’ll have to screw and unscrew the whole camera each time). Comes with a basic carrying bag. Manfrotto, one of the original tripod companies out of Italy, has a worldwide reputation for quality products. 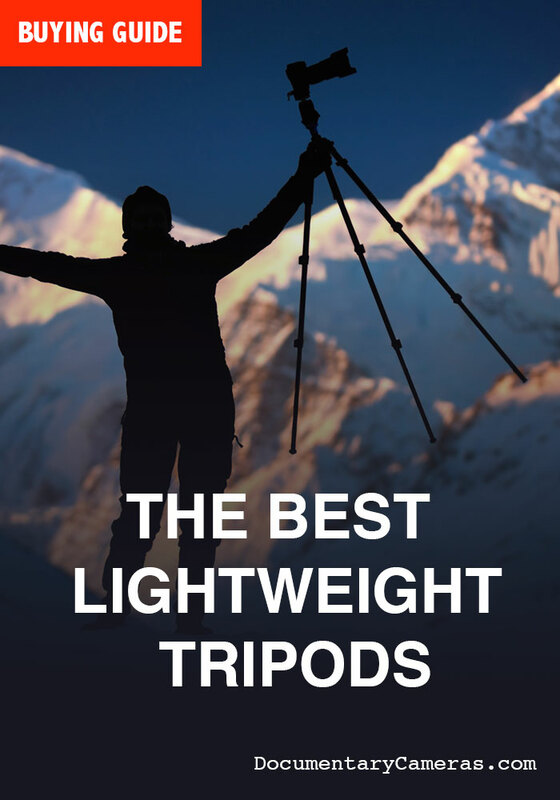 Their lightweight Compact Advanced Tripod is one of the lightest tripods for photographers that can still safely hold a reasonably heavy camera payload. This model works great with DSLRs with lenses as long as 200mm. Comes with two foldable ergonomic pan and tilt handles and its own carrying case with shoulder strap. Quick release plate design. If you need a seriously durable lightweight tripod for still photography, the Manfrotto BeFree Carbon Fiber tripod may be the best lightweight tripod for you. Carbon fiber is a material that’s both stronger and lighter than aluminum (the usual tripod metal), although it is a bit more expensive. Still, it’s lighter and sturdier than comparable tripods (Manfrotto also makes a heavier but cheaper aluminum version of this same tripod). Its quick release plate system also lets you disconnect and remount a camera swiftly without having to screw and unscrew the entire tripod. Comes with a sturdy carrying bag and shoulder strap. The Magnus VT-4000 is one of the best lightweight tripods for video. It features a fluid head for smooth panning and tilting, a quick release plate design and a mid-level spreader which lets you rapidly deploy it. The legs of this tripod, which adjust individually using convenient latches, have rubber feet which unscrew to reveal spikes which are especially useful for uneven ground outdoors. Comes with a carrying case and a bubble level in the head of the tripod to make sure you’ve got it set up level. The Manfrotto Be Free Live Tripod is one of the best lightweight tripods for video because it can accommodate cameras up to about 9 pounds (like DSLRs with heavy lenses or light pro video cameras) and it has a fluid head, making your panning and tilting smooth instead of jerky. Its maximum height is about 60 inches (5 feet) and it folds down to just under 16 inches long. Comes with its own carrying case. This is one of the lightest tripods for video that’s available today. The MVK502AM tripod by Manfrotto is probably the lightest tripod aimed at video professionals today. It features a sturdy twin leg design which can support up to 15 pounds of camera gear and lenses, and extends up to just over 5 feet in height. This light tripod has a fluid head and half ball design with a mid-height spreader to swiftly and easily deploy and level no matter what surface you deploy it on. Like most professional video tripods, this set of sticks also features a quick release plate system and sturdy controls, knobs and a detachable pan handle which allows for left or right-handed use. Comes with its own high quality padded carrying soft case. What is the difference between 3-way pan and tilt tripods vs ball joint tripods? Traditional pan and tilt tripod heads allow for movement up and down and side to side, as the name would suggest. This can mean that they pan smoothly in those directions but they can make rotating to diagonal angles very challenging or impossible. Ball joint tripods operate on a sphere (or half sphere), making it possible to adjust them to nearly any angle, increasing flexibility. Some people prefer ball joint tripod heads because they’re quick to set up but others may find ball joint tripods more difficult to level on uneven surfaces. There is no “better” or “worse,” it’s just a matter of personal preference or what you’re planning on shooting and in what environment. What is the difference between a photo tripod and a tripod for video? Tripods for still photography can often be thin and light because they don’t have to support much weight. They may be based around a pan and tilt or a ball joint head but either way they don’t need to have fluid heads for smooth motion during pans or tilts. Still photo tripods may also skip having a pan handle, which allows you to adjust where the camera is pointing with one hand. Meanwhile, tripods designed for video cameras often will have to be much sturdier than still camera tripods. They’ll also always have pan handles (sometimes even two!) and a good video tripod will have a fluid head for silky smooth movements. They may also have additional controls to adjust how much drag (resistance) they offer for panning and tilting, which helps you control how fast and loose or slow and smooth your camera movements are. What is the difference between aluminum and carbon fiber for tripods? Aluminum is a cheaper material but it’s also not quite as light or as strong. Some lightweight camera tripods are made out of carbon fiber but they tend to be more expensive in exchange for being stronger (i.e. support heavier camera payloads) and lighter than the equivalent aluminum model. What are the most important features to look for in a tripod? As with everything, it depends on what factors are the most important to you for whatever specific use you have in mind for a tripod. Commonly people will be interested in factors like: how tall does the tripod get (maximum height), how much weight can this tripod support (how heavy a camera– max payload weight), and whether it’s a ball joint head or a traditional pan and tilt head tripod. Others may be interested in how heavy the tripod is (and if you’re reading an article on the best lightweight tripod, we’d guess you’re looking at that), or how small a tripod can be folded up into when it’s collapsed. If you’re shooting video you’ll likely want a tripod with a pan handle and a fluid head. The weight of a tripod can be especially important if you’re going to be shooting video and lugging a heavy camera around with you all day long. Lightweight tripods can also be extremely desirable if you’re looking for a light tripod for travel purposes. Finally, some tripod buyers may be looking for niche features like having a bubble level in the tripod head (to determine whether it’s level on uneven surfaces) or inner spreaders to make deploying it rapidly easily. What is the best tripod under $100 for photography & video? What is the best video tripod for filmmakers?